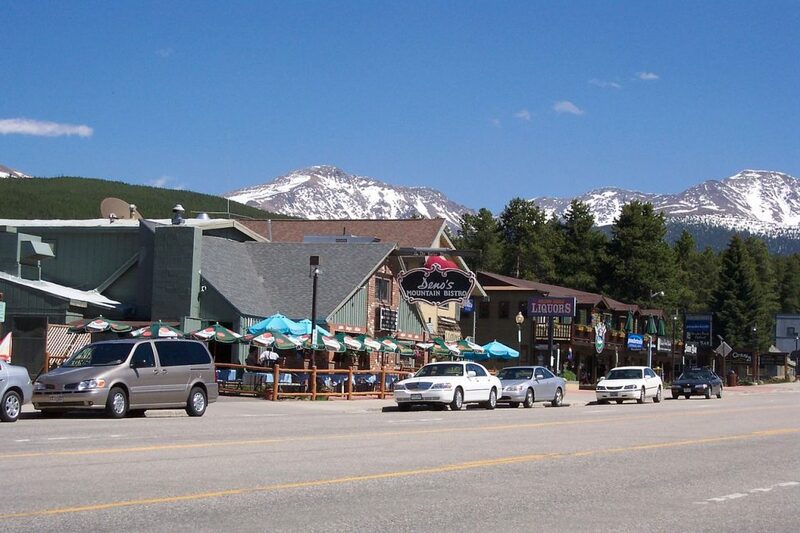 Winter Park is nestled peacefully in the Rocky Mountains with a population barely reaching that of 1,000 people. The town’s vitality fluctuates with seasonal workers who bolster life to this backcountry ski resort drawn in by some of the best outdoor activities you can find in the Rocky Mountains. This town is bread for winter activities with six months of the year being completely covered in snow and ranking as the #1 U.S. territory with the highest city limits at 12,060 feet. Winter Park ski resort is world class and offers some of the best terrain for skiing and snowboarding that Colorado has to offer. Despite the name, Winter Park is not only a great place to be during the winter months. It is one of the best places in the country for mountain biking and has been nicknamed ‘Mountain Bike Capital USA.’ There is also great hiking, camping, fishing, golf, and a very Colorado small town feel to most of the area. Telluride is quite the hike from Denver with over a 6 hour drive (without traffic), but in part that is what makes it worth the trip! 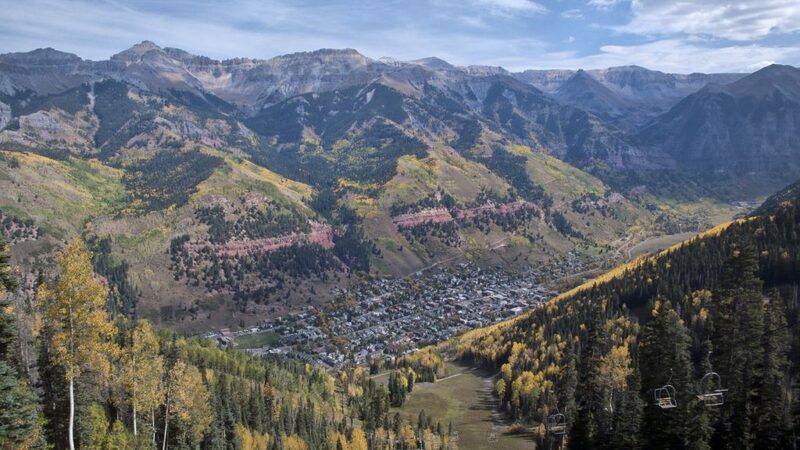 Hoisted high in the peaks of the San Juan Mountains, Telluride remains isolated with a sub-culture not found anywhere else. This cultural incubation entices many bands and festivals alike who gather to be simply be part of the high-altitude atmosphere – with festivals like Telluride Bluegrass Festival, Telluride Blues and Brews Festival, Ride Festival, Telluride Jazz Festival, and many more. The skiing is also as wide open as it’s culture, with many runs sloping above tree line. People who have skied Telluride often mention that its steep slopes that are often above the tree line are more reminiscent of a European ski resort and unlike any other resort in the state. Telluride boasts an abundance of outdoor activities all summer and winter long receiving 300 inches of snow and 300 days of sunshine in one year! This ideal weather fosters plenty of time to see their beautiful waterfalls (like Ingram Falls & Bridal Veil Falls) or go on an adventure by rafting down a river, mountain biking the 40 mile Telluride Mountain Run or simply traversing all the breathtaking sites on an easy to advance hiking exploration. 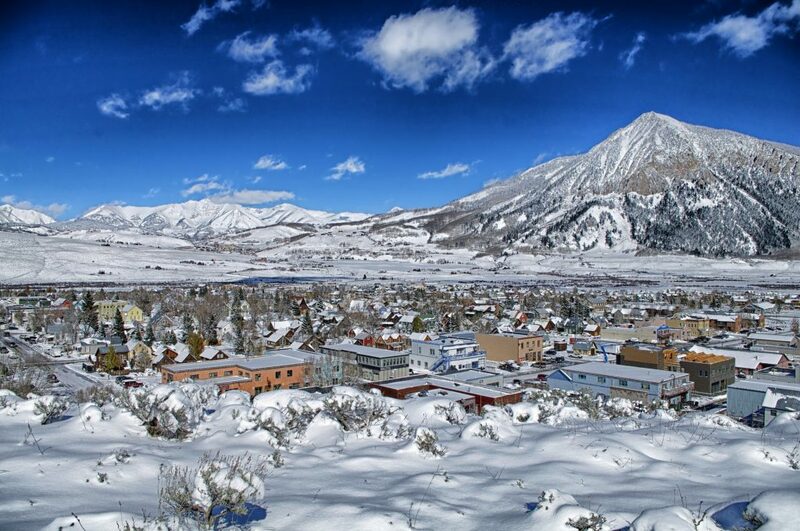 Crested Butte is acclaimed as the “Winner of the 2014 Powder Magazine Ski Town Throwdown Best Ski Town in North America” due to some of the best backcountry skiing in all of Colorado. That being said, this is definitely an experts mountain as Crested Butte Ski Resort’s 14 lifts serve 1,058 acres and 448 of them are double black diamonds! It’s intense level of mountain sports unthaws in the spring and flows into some of the most extreme mountain biking in all of America. For this reason, The Mountain Bike Hall of Fame calls Crested Butte home. There is never a shortage of things to do in this Colorado mountain town and it is unique with a proud history and deep rooted culture. This is likely why just last year (2014) Bud Light picked Crested Butte to be its debut location for “Up For Whatever, USA”. If you had to conjure up an image of a classic Colorado mountain town, Crested Butte is probably what would come to mind. Good people, beautiful terrain, and that laid back mountain vibe that so many of us seek. 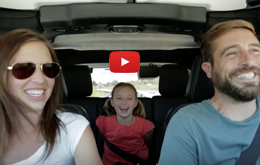 While many Coloradans prefer to enjoy the the freedom of the Rocky Mountains without the hordes we understand that some prefer a little more of a popular scene in their entertainment. 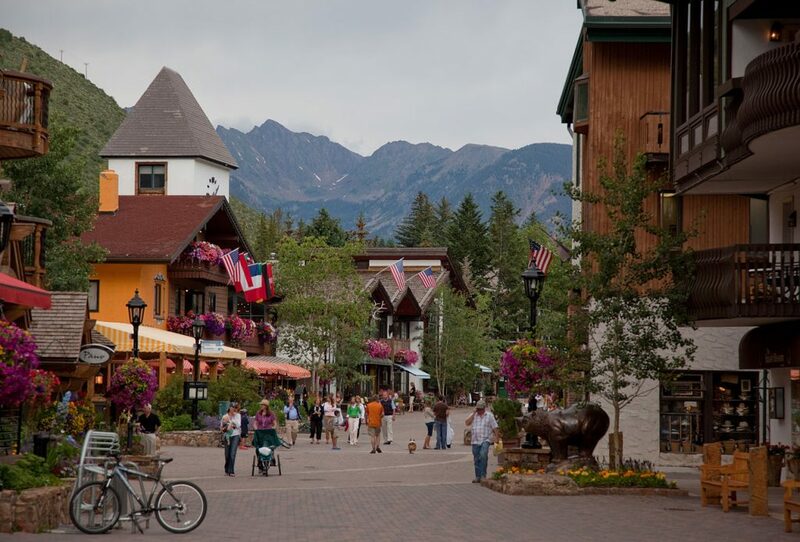 For this reason we have ranked Vail, Colorado as our #4 option for best Colorado Mountain town. Chances are you have likely heard of Vail and for good reason. Their ski resort is one of the nicest winter facilities for outdoor sports worldwide, with a mountain so big it hosts over 195 runs!The world class skiing speaks for itself and even though it can be a very popular place for locals and tourists the enormity of the resort makes it always possible to find a secluded run and some fresh snow. The town of Vail itself is magnificent and feels as though you’ve left the states for awhile. It resembles more of a Swiss or Austrian ski village with beautiful European architecture and style. Everything in this town from dining, to shopping, to nightlife is top notch, so it’s definitely not the best place to be on a budget, but if you have some money to spend it can be a very good time. There is always something to do in Vail and lots of people to do it with. 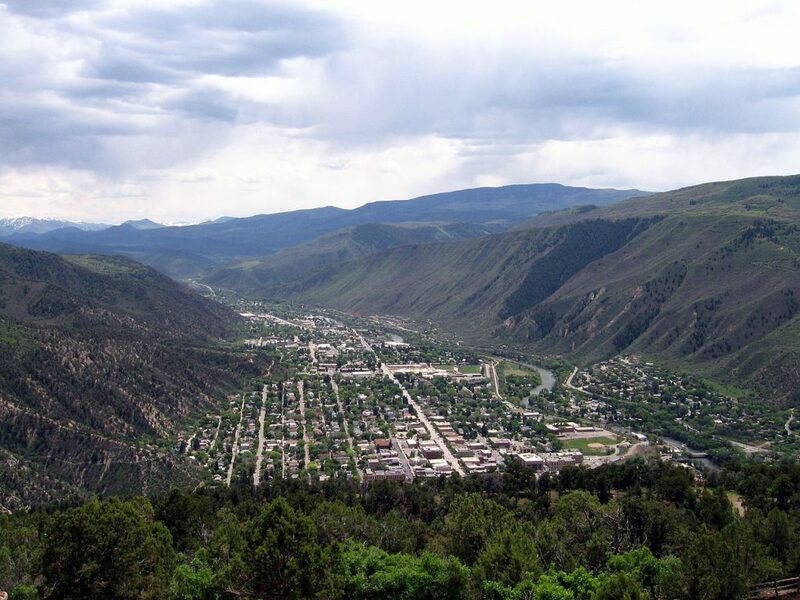 For those who want to live in the mountains, but without having a ski resort in your backyard and all that comes with it, Glenwood Springs might just be the place for you! The closest ski resort is 10 miles out of town plus there’s not a long drive to world class resorts of Aspen and Vail for skiing and mountain biking. It is primarily renowned for having the WORLD’S largest mineral hot springs! What’s more relaxing then the biggest natural hot tub pooled right in the middle of the Rocky Mountains? While Glenwood springs is known for it’s hot springs infused laid back mentality it has much more to offer. USA Today named it as the “Most Fun Town in America” with rafting, kayaking, fishing, paragliding, mountain biking, golf, bike trails, caverns, off roading , water slides, unique theme park, waterfalls, downtown events and oh… HANGING LAKE – just 7 miles east of Glenwood Springs, is one of the most beautiful waterfalls in the state. This town has a lot to offer and definitely isn’t just for those who love to ski and board.